This calculator will allow you to quickly total up your weekly time sheet hours and then compute your total regular and overtime wages for the week. Includes 4 In/Out columns and a printable time sheet report feature so you can print out a copy of the completed time sheet calculations. This is the third version of the original 2-column time sheet calculator, which I added in response to a request asking for a fourth in/out column. If this is your first time here, be sure to check out the following features. And just like the other versions, this calculator also enables you to enter times without any special characters at all!. And you can even enter times as military times if you want. And again, no punctuation required. And you will also be pleased to see there are no drop-down time or AM/PM menus to slow you down, nor will you never need to hit the back button or wait for the page to reload to recalculate. All the magic happens on this page! 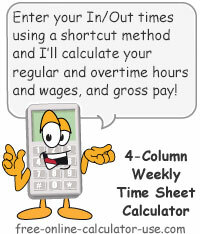 The weekly time sheet calculator also includes a Printer Friendly Report so you can print out a work-hours and gross wages report for each employee -- without printing everything else on this web page.